The Companies Act, 2013 comes into force with the aim of promoting the good corporate practices but in spite of that few companies are running for long and are allegedly used for illegal fund flows. Government has directed the branches of all the banks of those companies to restrict/stop the operation of the bank accounts of all such companies by their directors and authorized representatives. Directors has been barred to continue on the board of Directors of any company for the next five years as MCA has declare list of defaulting Directors of all Companies that did not filed their financial statements for the past three years. After this the directors are unable to file annual returns with ROC. In this article we will discuss on the alternatives available to remove the disqualification of directors. Some people think that disqualification can be removed by filing of application in DIR-10 with Central Government but in actual application in DIR-10 can be file only at the end of the tenure of five years of his disqualification. For this, a Writ Petition can be made by the aggrieved director under Article 226 of the Constitution of India. A scheme called “The Condonation of Delay Scheme, 2018” announced by the Ministry of Corporate Affairs which is active from 1st January 2018 to 31st March 2018. The companies whose status is active can apply for this scheme. In this case , a Writ Petition can be made by the aggrieved director under Article 226 of the Constitution of India as there is no alternate remedy available till now. 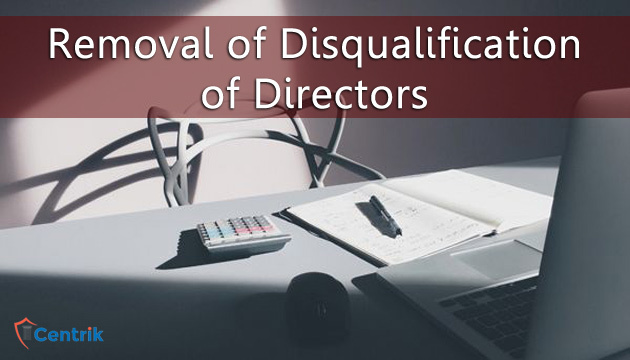 Hope this article helps you in understanding how important to remove the disqualification of directors is and what are the alternatives available for removal of disqualification.